Our founder, Matthew Rodriguez, has become an avid cat lover. He has two furry felines: Lina (who is shown on our Black and White Cat Graphic T-Shirt) and Huckleberry (who is the subject of our next cat t-shirt design). Now Hucky is a very interesting cat. Matthew has told all of us at Nocturnal Prototype many stories about his furry friend. 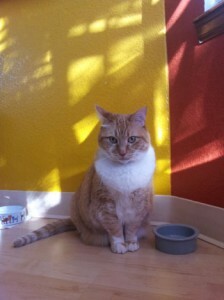 This chubby orange cat seems to have a personality all his own. Though Hucky never seems to be entertained by anything but food, his adventures always amuse us. Hucky enjoys drinking out of the shower – Surprising! Aren’t cats supposed to hate water? Hucky likes to sit outside the closed bathroom door and meow when he hears the shower running. It’s hard to ignore his ridiculous cries and eventually he is let into the bathroom. Making a beeline for the tub, this orange cat doesn’t even care about getting wet! I don’t know about you, but I’d probably not be a fan of sharing a shower with a cat! There are many more fun stories about this furry friend, including Hucky’s extreme laziness, his many failed escape attempts, his melodramatic cries for everything under the sun, and his undying love for his cat food (which happens to be the newest t-shirt design inspiration). Hucky has always loved eating. Food seems to be one of the only things this cat cares about. He seems to be drowning his sorrows in his food, like some broken-hearted women drown their sorrows in ice cream. What in the world could a loved and spoiled cat have to be sad about? I guess that’s the deva in Hucky as he seems to be pretty dramatic about everything. Well, whatever the reason, this chubby cat can’t wait to dig into a bowl of crunchy cat food whenever dinnertime rolls around. While Lina just nibbles on her food, Hucky devours it. Personally, I don’t know what the big deal is; it’s cat food! 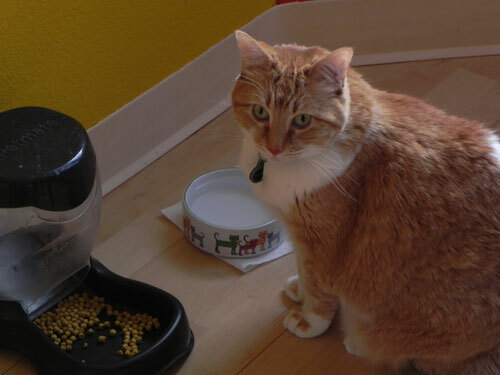 Here’s a little funny story of my own – when I was little I actually tried cat food. It was disgusting! Hucky sure seems to like it though – he is so obsessed with food; he could probably eat all day long. He’s constantly sitting by his bowl with a wide-eyed, Puss and Boots “Feed me, I haven’t eaten in days!” look on his face (When, in actuality, he had just eaten about an hour before). Cats are funny like that – they are excellent trick artists when it comes to acting like they are dying of starvation. This is the funny inspiration of the next cat t-shirt design – A humorous “Will Work for Food” cat begging for food. Despite his flaws, Hucky is one in a million. He is very loving and always finds time to cuddle up with his family in the evening. Matthew’s love for his furry friends inspired these current cat designs and many more to come. This graphic cat t-shirt design is a work in progress. Stay tuned for more of the creative process on the “Will Work for Food” cat t-shirt.